JERUSALEM (AP) — A wave of stabbing attacks has spread fear in Jerusalem and much of Israel, shattering the brittle sense of security Israelis had managed to restore a decade after Palestinian suicide bombings terrified the nation. The public panic has also exposed an ugly side, with some enraged residents calling for Arabs to be kicked out of their apartment buildings and many Palestinians afraid to venture out of their homes for fear of getting mixed up with vigilante mobs. The monthlong violence has mostly been confined to sporadic stabbings and clashes between Palestinian protesters and police. It has claimed the lives of eight Israelis and some 30 Palestinians, a far cry from the years of near daily shooting and bombing attacks that killed more than 1,000 Israelis and thousands of Palestinians in the early 2000s. But already, a siege mentality has taken hold. “The sense is that the entire country is the front line, and that everyone is a candidate for stabbing,” Nahum Barnea, a columnist for the daily Yediot Ahronot wrote recently. Municipalities have increased security patrols, the government has eased gun licensing procedures and public officials, including Jerusalem Mayor Nir Barkat, are openly carrying personal weapons and encouraging the public to do the same. Several bystanders have already subdued attackers, but there have also been incidents of quick gunfire that have sparked fears among Palestinians that if they are even perceived to be a threat, they might get shot. “People are afraid. They fear being shot, so they prefer to stay at home until this thing is over,” said Zakariya Alqaq, a Palestinian university professor. The violence began with clashes at Jerusalem’s most sensitive holy site and quickly spread to Arab neighborhoods of east Jerusalem, across Israel and to the West Bank and Gaza. Israeli leaders say the violence is due to Palestinian incitement. But Palestinians say it is the result of years of Israeli occupation, failed peace efforts and lack of hope among their youth. For Israelis, stabbing attacks have become near-daily occurrences, mainly in Jerusalem but also in the Israeli heartland, in cities such as Tel Aviv and in residential Raanana further north. Israel has been unable to quell the attacks, carried out seemingly spontaneously by young Palestinians without any affiliation or support from militant groups. In a bid to contain the violence, Israel has deployed soldiers in its cities to back up thousands of police officers and has erected concrete barriers and checkpoints at the entrance to Arab areas of east Jerusalem, where many of the attackers are from. Jerusalem has been the focal point of the violence, where Jews and Arabs in every corner of the city have begun looking over their shoulders, fearing the violence could hit them too. On Thursday, the alleyways, shops and cafes of the usually bustling Mahane Yehuda market were nearly emptied of shoppers, and vendors complained of a drop of some 70 percent in sales since the violence began. Police in vans, on motorcycles and on foot patrolled the area near the city’s central bus station where a Palestinian attacker stabbed a 70-year-old woman Wednesday, checking the identification cards of Arab men on the street. Moshe Niddam, a 16-year-old meandering around the nearly barren area outside the bus station, brandished a small paring knife that he has begun carrying for self-defense. “I’ll tell you this, if the attacker … intends to stab me, I will also take out my knife,” the Israeli teen said. The fears have sometimes turned into outright panic. After the bus station attack Wednesday, word of a potential second attack sent a swarm of security forces and civilians in a mad dash down a central road, until it was declared to be a false alarm. 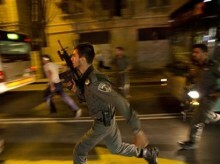 On Thursday, police sealed off streets in and around Tel Aviv after reports of a suspicious vehicle. Earlier this week, an Israeli man stabbed a fellow Jew in an IKEA parking lot in northern Israel after mistaking his dark-skinned victim for an Arab. Palestinian residents of Jerusalem have watched as police or bystanders have opened fire on assailants, in many cases killing them. When attackers have been apprehended alive, angry mobs have often kicked or punched them. Many Palestinians in east Jerusalem have opted to remain at home, and Arab citizens of Israel have complained of being afraid to speak Arabic in public. In one widely shared Facebook post, a Palestinian living in Tel Aviv said a neighbor demanded in a letter to building residents that he be “checked out” in light of the security situation. Mohammed Abu Sabih, a resident of east Jerusalem who sells produce at the Jerusalem market, said Palestinians in Jerusalem are warning each other not to walk around with their hands in their pockets so that no one suspects them of hiding a knife. “It’s not safe for us,” said Abu Sabih, 24, who said he asked his Jewish boss to pick him up and drive him home from work as a precaution. As the attacks have spread beyond Jerusalem, Israelis nationwide have stocked up on self-defense weapons, such as mace and guns, and shops have reported a dramatic spike in sales that has emptied shelves. Private security firms say they are stretched to the limit and have been forced to reject assignments for lack of manpower. The Rikoshet outdoor sporting company said massive demand has depleted its 40 branches of pepper spray. They are now importing it urgently and running a waiting list for anxious customers. At one store in the Israeli city of Kfar Saba, shelves were empty of pepper spray but still had handwritten instructions on how to use it. Instead display windows offered a sale on electric shockers and saleswomen reported increased demand for batons, knives and other weapons. Some parents have kept their children home from schools without full-time security, and others have taken to patrolling outside kindergartens. One mother pleaded online to other worried parents to allow their children to attend her daughter’s 4th birthday party, assuring them that the gates of the park where it was to be held would be locked and two of the adult guests would be armed. Those eligible for guns have been flooding arms shops.